The Hurricane was developed by Hawker in response to the Air Ministry specification F.36/34 (modified by F.5/34) for a fighter aircraft. It was to be built around the new Rolls-Royce engine, then only known as the PV-12, later to become famous as the Merlin. At that time, RAF Fighter Command comprised just 13 squadrons, each equipped with either the Hawker Fury, Hawker Hart variant, or Bristol Bulldog – all biplanes with fixed-pitch wooden propellers and non-retractable undercarriages. The design, started in early 1934, was the work of Sydney Camm. Camm's original plans were at first rejected (apparently "too orthodox," even for the Air Ministry). Camm tore up the proposal and set about designing a fighter as a Hawker private venture. 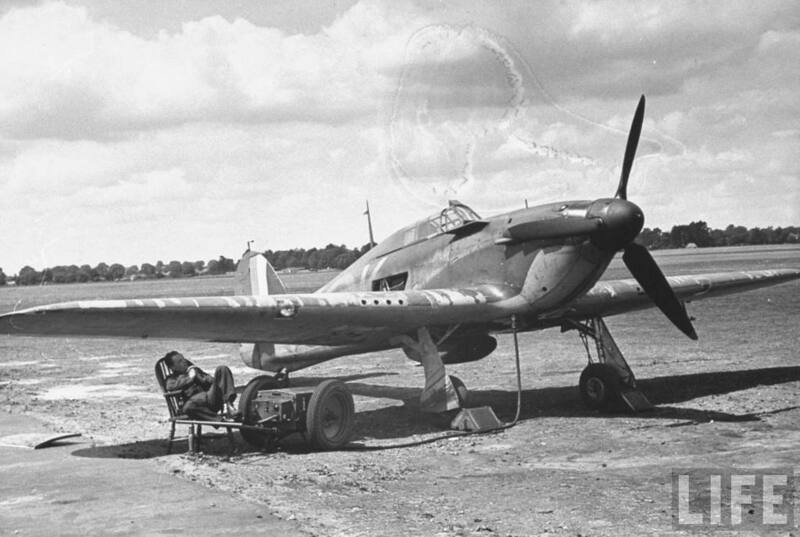 With economy in mind, the Hurricane was designed using as many existing tools and jigs as possible (the aircraft was effectively a monoplane version of the successful Hawker Fury). Early design stages of the "Fury Monoplane" incorporated a Rolls-Royce Goshawk engine, but this was replaced shortly after by the Merlin, and featured a retractable undercarriage. The design came to be known as the "Interceptor Monoplane," and by May 1934, the plans had been completed in detail. To test the new design, a one-tenth scale model was made and sent to the National Physical Laboratory at Teddington. A series of wind tunnel tests confirmed the aerodynamic qualities of the design were in order, and by December that year, a full size wooden mock-up of the aircraft had been created. Construction of the first prototype, K5083, started in August 1935 incorporating the PV-12 Merlin engine. The completed sections of the aircraft were taken to Brooklands, where Hawkers had an assembly shed, and re-assembled on 23 October 1935. Ground testing and taxi trials took place over the following two weeks, and on 6 November 1935, the prototype took to the air for the first time, at the hands of Hawker's chief test pilot, Flt Lt (later Group Captain) P W S Bulman. He was assisted by two other pilots in subsequent flight testing. Philip Lucas flew some of the test flights. John Hindmarsh conducted production flight trials. Top speed for the Mk I, which fought the Battle of Britain, was rated at 335 mph. In-service trials of six Hurricanes delivered poorer average results, the average coming out at about 305 mph.